It is laudable you start playing the game of darts. If you attentively & seriously do regular practice, you can make your own way to become a professional player that will create an opportunity to upheaval your honors in society, & to earn money. Whether you play darts for making fun or practicing to sharpen skills you need to appropriately select beginner’s darts. Remember, attention & hand-eye coordination not only assists you to hit the bullseye or target scores of the dartboard but also need well performance darts. It will not be an easy task to choose the perfect dart without knowledge of darts. We help in this guide to know the best things that will help you to choose the right for you. Let’s know. There are four main parts to a dart – the point (tip), barrel, shaft (stem), and the flight. Typically, your dart will come in three parts with the point and the barrel all in one. Depending on your needs, you’ll find a number of designs for all three of these parts. With metal points on the darts and bristle dartboards, this is the combination of choice in the UK and Europe. The sport itself actually started with soldiers throwing metal arrowheads or spearheads; therefore, steel tip darts are traditional, heavier, and durable. Over time, the dartboard wears from all the holes created by steel and it will need replacing. Additionally, the darts themselves need to be sharpened (if not used regularly) to ensure they penetrate the board. Alternatively, soft tip darts have a plastic tip and they can be played on electronic dartboards. Used across the US and much of Asia, soft tip darts allow for a safer game not only for the player but for their surroundings (a home, for example!). For the board itself, it has tiny holes in which the darts enter as the player throws. Some highly-advanced dart boards can do the math automatically as you throw. How to Choose Right Dart for You? 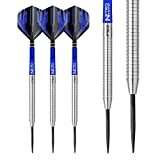 Whether you are going to buy soft tip darts or steel tip darts you should consider the things of a dart that I have mentioned below. Firstly, as part of this beginner darts buying guide, we recommend choosing a slim flight because this will minimize the risk of darts hitting each other. When the tip of an incoming dart hits the flight of a dart already in the board, it can send it off target so slim flights will be beneficial to your game. With aluminum as the main material, you’ll have a durable dart that doesn’t get damaged when hit by other darts. With the added weight, it can also be easier to improve accuracy and get good scores time after time. For beginners, 80% tungsten is considered the best way to balance affordability and quality. With a high-quality 80% tungsten dart, you’ll be able to throw with accuracy and the whole dart will come together to help you play. With the slim flight, aluminum shaft, and 80% tungsten, you’ll soon find consistency with your throw. Above all else, we recommend finding darts that suit you. If you look at professionals, they all have different designs and materials to find the one that matches your needs. What Gram Dart Should I Use? Soft tip Darts 14 to 16 grams. Steel Tip Darts- 20/22/24/ grams. The best dart weights advice is to settle for what makes the beginner comfortable when they play the game of darts. One of the things that I discovered about this dart is that it is rich in form and there are few darts that can match its quality. It is crafted by some of the leading minds in the area of dart design and production. Exceptional Balance: The combination of 90% Tungsten and 10% Nickel barrel frame in a sliming profile gives this dart a very dynamic performance level. It is on record that some of the finest performances that have been recorded in the game of darts are linked to this product. A single investment can put a broad smile on your face for many seasons. Aluminum shaft with locking holes: The use of diamond-cut aluminum shaft with locking holes gives this dart tight fitting. You can feel the lightness, precision, and beauty as you use it to play the game that you have always loved. I recommend this dart for those who want something that can help them enjoy the greater flight. It has all it takes to give you the edge even if you use it for a competition. Deluxe Dart Pal Case: This deluxe dart case helps to rightly package the product and makes it the ideal winner when you lay it side by side with other conventional darts. An additional set of convex nylon shafts. Not sold in all countries in the world. Final Thoughts: I will refer to this product as the first choice for those who want to take their game of darts to a whole new level. It is classy, trendy and can help even the beginners to raise their game. When you want to experience the real charm, finesse, and class; this is the dart that is perfect for you. It has been called one of the top darts for beginners, but I call it the only dependable companion that you will ever need. Compact Design: It is made for a dynamic material that ensures that you can use it for as long as you desire. The 80% Tungsten barrel means that the issue of balance, weight, and strength has been equitably taken care of. It is important to mention that this dart has the edge to help you pinpoint your targets and make real impressions with your audience. The use of tungsten automatically puts it in the class of darts that are used by top-line professionals. High-Level Accuracy: Another amazing feature of this dart is that it does not easily fall off your hands. There are different styles that people use when they want to play the game of dart. The razor-like design makes it your ideal choice if you want to play the game in a seamless fashion. Beyond the fact that it aids your performance and takes it to a whole new level; you can step into a brand new world where quality darts rule through the purchase of this product. Powerful Makeup: The top spin revolving shaft means that you can enjoy the kind of edge that most conventional darts do not give. Many people who refer to themselves as masters in the game attest to the uniqueness of this feature. I recommend it for those who are learning the basics about the game and for those who play the game of darts at a professional level. Ideal for You: The Galaxy metal carrying case makes it the perfect gift for your loved ones. You can decide to keep this in your home or office as part of your interior decoration items, or you can use it as a compact package that goes with you on every trip. One of the things that I love about this case is that it is designed to withstand the elements. It has a unique value that takes this product to a whole new league. Comes in a unique metal case. Not the cheapest dart in the market. Final Thoughts: When you want to make the right impression wherever you play the game of darts, this is the product of choice. It has the perfect finish, and it is designed to serve you for many seasons. You can feel the spark and the amazing beauty that come with this dart. It is one of the best things that can happen to anyone who wants to light up their world in style. It is good for you. Anodized Aluminum Shafts: Some experts will be quick to tell you that the shaft of a dart will determine its suitability for use. The anodized shaft design means that you can give your throw and hit the target with ease. Nothing beats the frame and the context that come with this uniquely designed product. It is ideal for everyone who values quality and precision. It does not have too many products of its class on the market. Packaged in deluxe Croco case: One of the best things about this soft tip dart for beginners t is that it comes in a case that gives the WOW effect. If you choose to use this as a gift or make it part of your dart collections, it can give you the amazing charm that you desire. 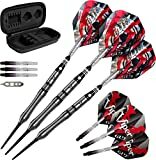 Anyone who comes across these set of darts will attest to the fact that it is powerfully designed and leaves the right impression on the mind of many. Strong: The 90% tungsten barrel design does not only give it strength, but it also helps the product to be attractive to the eyes. When you talk about durability and other things that make the dart to stand out; you will see that this is one of the best investments that you can make. It has the capacity to keep serving its users for many seasons. Comes in a trendy case. Does not easily wear out. Good for hitting your targets. Cool for the person of style. Perfect for a different level of players. Not too many darts in the case. Not good for professional players. Final Thought: There is nothing as wonderful as giving this dart as a gift to your loved ones. It has a cool design that makes it the center of attraction. You can unlock the rich treasures in this product as you make it part of your everyday dart playing experience. Here we have reviewed 2 Steel Tip Darts for Beginners. Locking holes: This allows for additional stability and helps you to gain the right leverage that you desire. There are few darts that can enjoy the flight that you get with this product. It has a very solid clinical finishing that makes it the choice product for those who want to raise their game. Gripping points: The barrel encourages consistent hand placement and helps you to step things in the right gear. You cannot go wrong when you know that you can light up the scene with this uniquely designed product. It is simply an amazing offering that keeps adding color to your world. Does not contain many darts. Final Thought: The strength of this product is that it covers in beauty and strength what others try to match by quantity (higher number of darts in a case). It is one good investment that you can make today. Quality cannot be expressed in a better format than with this amazing product. It is the top essence of everything that people desire as it relates to darts. I call it the One and only dart you need if you are on a budget. Amazing Extra: There are certain things that make a product stand out from what you easily find in the market. One of these is the checkout card that comes with this amazing product. In my estimation, with the inclusion of this item, this dart leaves even its nearest competitor in the dust. It is the answer for those who want something extra and do not want to spend a fortune to experience it. Aesthetics: The sport engineered grooves make it the ideal dart for those who love exceptional balance. Another thing that makes this item tick is that you can use it to hit your targets with ease. The law of aerodynamics is applied to each curve which helps to give you requisite satisfaction. Accuracy: The systematic profiling of the darts means that you can enjoy long flights with ease. When I tried to look extensively at this product in the light of others in the market, I discovered that it is head and shoulders above the rest. It is obvious that the manufacturers paid attention to the needs of consumers before producing this dart. Cannot be used with an electronic dartboard. Final Thoughts: The excellence and the charm that reflects all through this product is something that you cannot easily find with other darts. I recommend this product for those who want to have a unique dart playing experience.